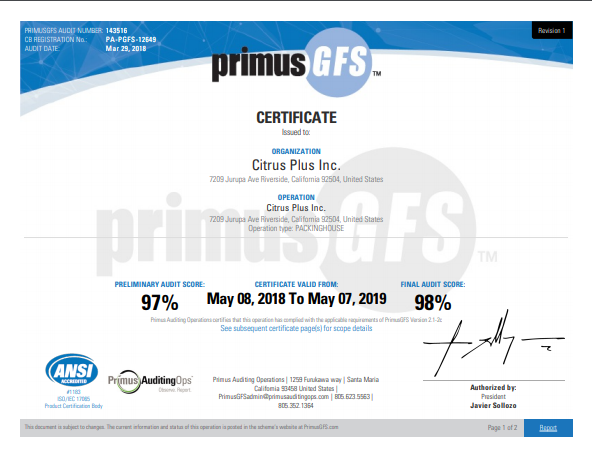 Citrus Processing is taken seriously at Citrus Plus inc. We are committed to food safety and providing our customers high-quality citrus that is safe for everyone to enjoy. Our staff is trained in HACCP and FSMA Preventative control procedures to ensure food safety through each and every citrus processing step. A qualified individual that has been trained and has experience in the industry. A plan that is made to cover chemical, biological and physical hazards as well as radiological hazards. Requires technical and/or scientific information that backs up the plan. Specifically, information that demonstrates the plan will be effective at properly controlling hazards. Conduct a thorough hazard analysis for all food-processing procedures within the facility. Once developed, have the ability to implement preventive controls, and then monitor the controls’ effectiveness continuously. Provide a detailed plan in writing, describing how the hazards will be controlled, and the preventive controls put in place. A schedule and methodology for monitoring the efficiency of the controls continuously. Verify the effectiveness of the controls, also maintaining written records of the verification processes. Facilities that are FSMA compliant are ensuring that there is an established food safety system implemented. Which also includes an analysis of hazards and risk-based preventive controls. In this food safety plan, there are requirements that include, Hazard Analysis, Preventive Controls, Monitoring, Corrective Actions, and Verification. Following FSMA and HACCP guidelines for compliance is what ensures the safety of the public when consuming processed foods, (and in this case, processed citrus.) Clean facilities with these guidelines in place ensure that food contamination is less likely, and in the case that it does happen, the risk is swiftly removed. Citrus Plus Inc. is dedicated to ensuring that the public receives safe to eat citrus that is delicious and healthy.